Our third Dollfie Dream® from ‘Touhou Project’ is Sakuya Izayoi, the chief maid who pledges her loyalty to Remilia Scarlet, the mistress of the Scarlet Devil Mansion. Her signature pale hair and the simple yet beautiful silhouette of her maid dress have been accurately recreated. 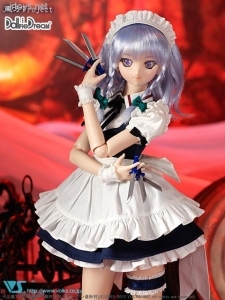 Sakuya’s main weapon, her six knives, can all be sheathed in the knife holder. This rich set also contains a pocket watch, where her ability to control time originates. The perfect harmonization of Sakuya Izayoi with Dollfie Dream® will capture you. The First Use of the DD Base Body III! The “DD Base Body III”, which has inherited the performance of the Dollfie Dream® Sister (DDS), is used for the first time with Sakuya Izayoi. The line of the body is almost the same as the current DD, but this new body has as much articulation and pose-ability as the DDS. The possible expressions have been extended even further! * Touhou Project items are not available for overseas sale. * Please be careful as the color of the wig may stain the surface of the doll. We recommend the use of a “Dollfie® Head Cap” to prevent the wig staining the doll's head. * This doll is made of PVC. Please keep away from heat.